We present this essay, based on scientific research, to help aspiring devotees recognize THE NEED TO TAKE REST EARLY each night (latest by 10 p.m.), and to rise by 4 a.m. each morning in order to chant the Hare Krishna Mahamantra and attain the perfection of human life. After conducting hundreds of experiments on sleep and health, the world’s leading scientists have discovered that to keep optimum health, one should sleep early and RISE BEFORE SUNRISE. The best hours of sleep for your body are between 10 p.m. and 6 a.m. The scientists say going to sleep at 11 p.m., 12 p.m. or 1 p.m. is extremely harmful to human health, and is a direct cause of many modern “killer diseases” such as heart disease and cancer. Nature acts and moves according to precise rhythm cycles influenced by the rotation of the earth, sun and moon. Daily the sun rises and sets, the seasons come and go, the moon waxes and wanes, and the ocean tides rise and fall. The function of sleeping and wakefulness is part of this natural rhythm. In Nature, one finds that the animals and plants are awake and asleep in tune with these rhythms. Human beings also have natural rhythms. Our human bodies, like Mother Nature, function according to natural cycles, body rhythms commonly called the internal body clock or the biological clock. Disruptions of the natural functions of our biological clock due to improper habits and incorrect sleeping patterns cause many different diseases. When our bodies are out of balance and not functioning in harmony with Nature, nothing seems to feel right. This is because hormones, chemicals and neurotransmitters that determine our energy levels, vitality, and how we feel, sleep and eat are out of sync. In other words, we are imbalanced and out of tune with our biological clock. We are going against the natural harmony established by Mother Nature and Bhagavan Sri Krishna. Before the introduction of electricity in Indian villages, people would just naturally just go to bed shortly after sunset, as most animals do and which Nature intended for humans as well. The best hours of sleep for your body are the hours of 10 p.m. – 6 a.m. These hours and what your body is naturally programmed to do during these hours are governed by the movements of the sun and the 24-hour natural rhythm cycle of your internal body clock; both of which are beyond your control. During these times (10 p.m. –6 a.m.), the human body is meant to be at a state of rest, repair, detoxification (elimination of waste products and poisons) and rejuvenation. Due to TV, computer, cell phones and Internet absorption most people nowadays are foolishly going against the natural order and design of our body. As a result, we will pay the price by getting various diseases and problems. For example, if your body is overtaxed digesting a heavy late meal or you are up late (after 10 p.m.) working, playing, watching TV or computer, your vital body energy is focused there and not available for rest and rejuvenation. Remember: Bad action brings bad reaction! We are free to stay up late, and we make that choice. And thus we ignore our bodies, which want to rest so they can do the many things needed to keep us healthy. Let your mind rest once and a while, and give your body some time, so it can do what it has to do to reward you with good health. The saying is “Health is the greatest wealth”. The main internal organs of your body work according to a “Time Schedule”. Knowing how your body works can help you regulate your schedule in order to attain the optimum level of health and well-being. 9.00 p.m. – 11.00 p.m.: At this time, your body eliminates toxic chemicals from the immune system (lymph nodes). It is best to be sound asleep by 9 p.m. or 10 for your body to properly execute this important function. 11.00 p.m. – 1.00 a.m.: This is the time your liver eliminates poisons and rejuvenates itself. It is best to be sound asleep by 9 p.m. or 10 p.m. for your body to properly execute this important function. 12.00 midnight to 4.00 a.m.: This is the time your bone marrow produces blood. 1.00 a.m. – 3.00 a.m.: This is the time your gall bladder eliminates toxins and rejuvenates itself. 3.00 a.m. – 5.00 a.m.: This is the time your lungs eliminate toxins and rejuvenate themselves. 5.00 a.m. – 7.00 a.m.: This is the time your colon eliminates poisons and rejuvenates itself. This is the proper time to empty your bowel. 7.00 a.m. – 9.00 a.m.: This is the time that vitamins, minerals, proteins and nutrients are absorbed in your small intestines. You should definitely eat breakfast at this time. Scientists have concluded that everyone should go to bed early (falling asleep by 10 p.m.) to obtain quality sleep, which will ensure proper physical regeneration. When you cooperate with your internal biological clock and allow Nature to take her course, you will feel refreshed, joyful and energized when you wake up (by 4 a.m., of course!). Going to bed before 10 p.m. is essential to keep the human body in tune with Nature and to remain healthy, happy and holy. Material scientists have concluded that the average human being needs 8 hours of sleep per day, which is best obtained by sleeping between 10 p.m. – 6 a.m. However, if you follow a spiritual path by eating sattvic vegetarian food [especially Krishna prasadam], your body becomes healthy, light and sanctified. And by chanting the Hare Krishna Mahamantra and engaging in Krishna’s devotion, your mind becomes purified, pacified and relaxed. If possible (if there’s a will, there’s a way), everyone should follow the golden rule to rise at 4 a.m. in order to be healthy, mentally happy and progress nicely in spiritual life. There is a saying, and it’s true: “Early to bed—early to rise—makes one healthy, wealthy and wise”, provided of course that you chant Krishna’s Holy Names and serve Sri Krishna, Sri Guru and the Vaisnavas. Obviously to rise by 4 a.m, you must sleep early. Practice makes perfect. You have to try sincerely to change your schedule and work towards this goal of taking rest at 10 p.m. and rising at 4 a.m.
CAVELIKE DARKNESS: The bedroom should be pitch-black, so you can’t even see your hand in front of your face, which means no bright lights, clock lights, night lights or any light coming in from the windows. Why? When we sleep in total darkness, the human brain produces a hormone called melatonin. Melatonin is an important antioxidant which protects our DNA structure and prevents cancer. Tests prove that even a small amount of light hitting the skin almost immediately shuts off the production of melatonin. DAILY GO OUTSIDE AND GET NATURAL SUNLIGHT: This helps regulate your biological clock and increases the production of melatonin, which promotes well-balanced sleeping patterns. DAILY EXERCISE: At least thirty minutes a day will help improve the quality of your sleep. HOT SHOWER BEFORE BED: This relaxes the body and helps you fall asleep quickly. SLEEP AS EARLY AS POSSIBLE: You should be in bed and FAST ASLEEP by 10 p.m. WEAR SOCKS TO BED: THIS APPLIES TO COLD CLIMATES ONLY. THE BEDROOM SHOULD BE FREE FROM ELECTROMAGNETIC FIELD: Do not keep a TV, computer or any other electronic item in your bedroom because they create strong electromagnetic field which disrupts the quality of your sleep. FRESH AIR: Open the window at least a crack to get fresh air to circulate while sleeping. AVOID FLUIDS: Do not drink any fluids two hours before sleep. SLEEP REGULATION: Get up and go to sleep at the same time everyday. If you are up late one night, still rise at your usual time and nap later in the day. DAYTIME NAP: If one needs to take a nap in the day, it should not be longer than one hour for optimal rejuvenation, rest and repair. If you nap longer, it will disrupt the night-time sleep quality. AVOID NOISE: Because it disrupts sleep. HOT WATER BOTTLE: To relieve tension and anxiety, place a hot water bottle between the navel and the bottom of your ribcage. HEAD MASSAGE: To relax before sleeping. FOOT RUB: Rub ghee or sesame oil on the bottom of your feet to promote restful sleep. We hope this essay will help everyone understand the extreme importance of sleeping at the proper time, and rising early in order to realize the full potential of this rare and valuable form of human life. Our heartfelt desire is that each and every one will live a long healthy life full of Krishna bhakti, spiritual happiness, and attain the ultimate perfection of RadhaGovinda’s eternal loving service in the groves of Vrindavana. Jai Jai Sri Radhe! 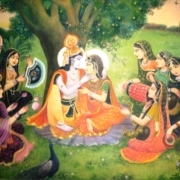 Giridhari Shyama ki jai! Sridhama Vrindavana ki jai! 2017 GITA JAYANTI: How To Properly Observe?